Back in December, we penned a brief piece on the rapid rise of low-quality bond yields – the price was dropping out of the things, and it made a very impressive rocket-ship looking graph. 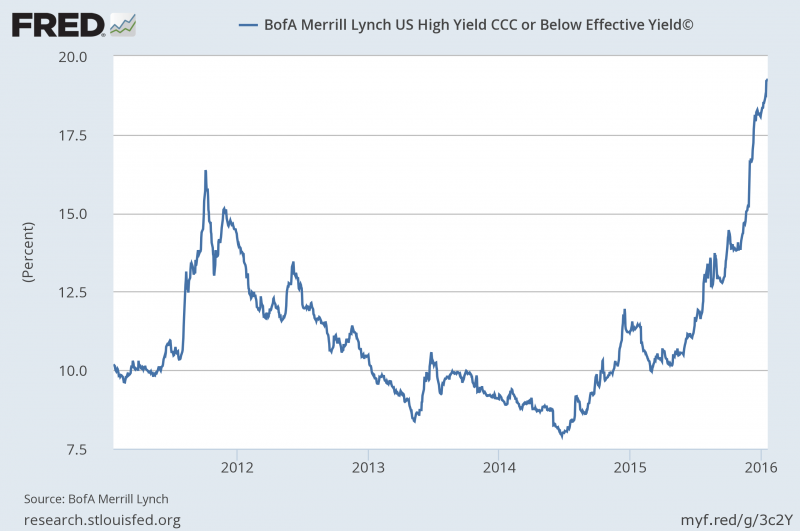 One of the more important reasons to track high yield bonds isn’t to look for an attractive entry point – I’d argue (and who’d disagree at this point?) that it’s still too early to make a move into a high yield fund. No, dear reader, it’s important to track below investment grade bonds to get a bead on what your fellow investors are thinking. If the spread between low quality corporates and high quality corporates is rising, that indicates fear in the market as people reduce the amount of risk in their portfolios and shift to higher quality – and higher rated – assets. Quick math on the timeframe in the chart: from January 20, 2012 to January 20, 2016 CCC and below rated bonds would have returned 6.917% total. But hit me with your best investment hypothesis. Or, you know, tell me the best way to pay no attention to the market and come back in a couple months. Your call. as an investor in JNK. I learned the hard way (look at its recent performance to understand what i mean) that i might have been better off in vanguard’s VWEHX (or VWEAX if you have 50k or more to invest). Although this is a mutual fund, and not an ETF as Vanguard has no high yield bond ETF it has a less risky profile as its holdings rarely dip below the BBB line. 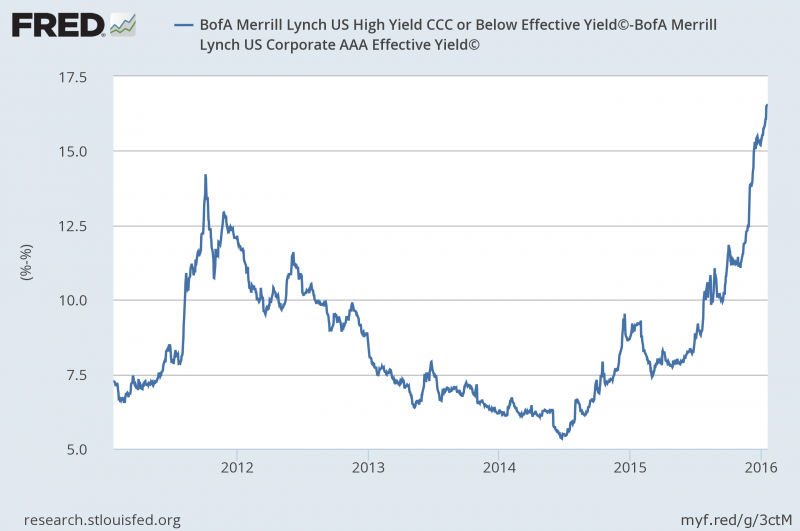 Ever considered taking the junk bond plunge? There are definitely time periods where’d you be very happy to have been in them, if you can stomach the volatility (as evidenced in this piece). Not suggesting it’s worth it now (or yet? ), just that it might eventually be an interesting place. apologies. i wasn’t clear. i am in JNK. had i done more research i might have invested in the mentioned vanguard junk bond mutual fund. it has less ‘junk’ which is to say it doesn’t dip much below B grade.